DVD players built into cars are a great way to keep kids mesmerized on road trips, but the wireless headphones that automakers commonly supply with their rear-seat entertainment systems may not fit comfortably on small heads. So, Kidz Gear has introduced a set of wireless car headphones specifically designed for a child’s anatomy, with smaller headbands and padded ear cups. 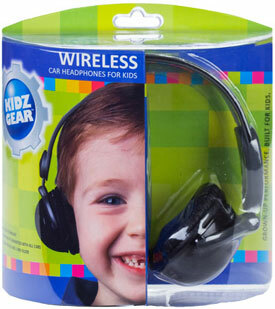 The Kidz Gear Wireless Car Headphones for Kids also have an independent volume control—allowing the child to adjust the headphones’ audio volume separately from the system’s audio volume—and an automatic shut-off feature for when the headphones are not in use. The headphones use 2 AAA. which last for 60 to 80 hours of continuous use. But before you buy these headphones, check to make sure they’ll work in your car: They’re compatible with car entertainment systems that use infrared technology to play audio through headphones. Great prices on Amazon.com, but I was also able to find some terrific IR wireless headphones on http://www.audiovideo2go.com . I agree with the article - if you are a parent, and want to keep your sanity, you need wireless headphones for your kids!